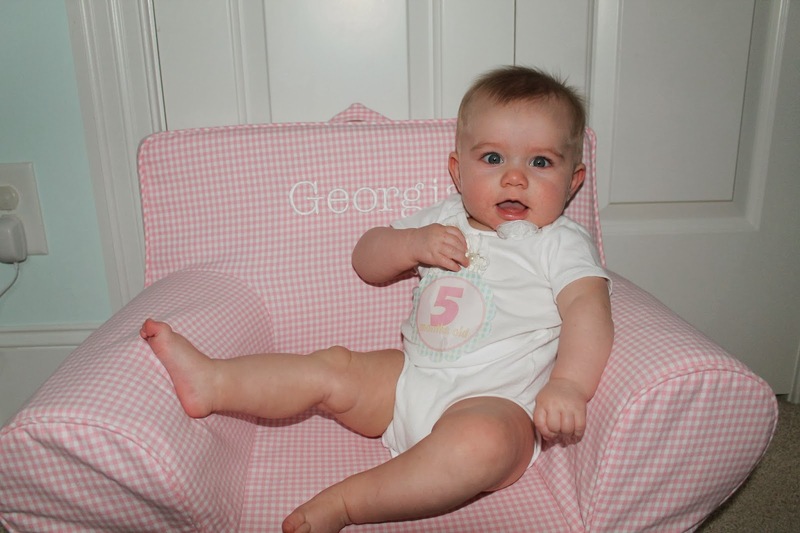 Gratefully Inspired: Georgia is 5 months old! Where has the time gone?!?! 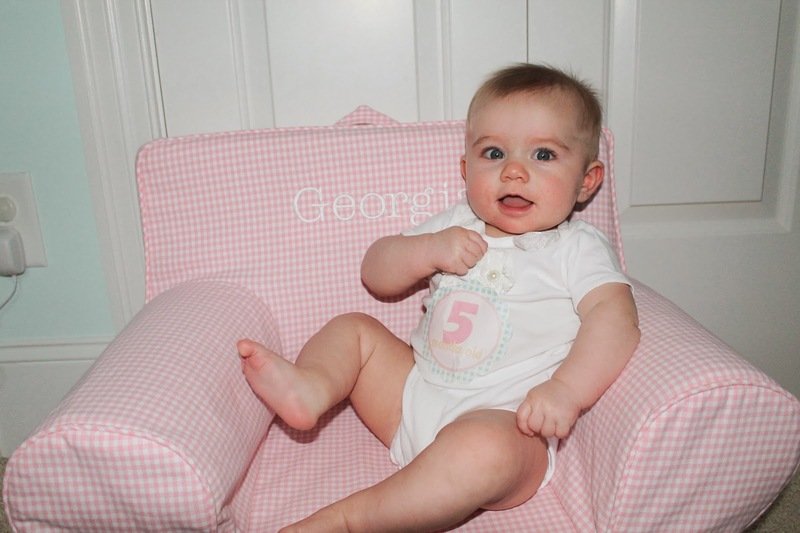 Georgia is 5 months old! Where has the time gone?!?! 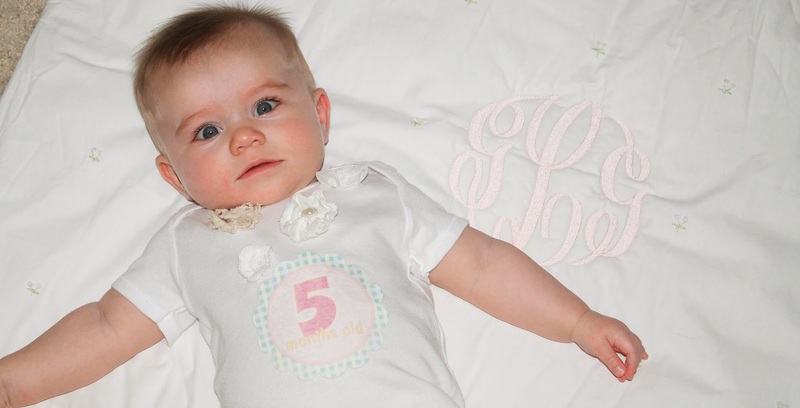 I know I say this every month but HOLY COW I can't believe my wittle babe is 5 months old! Well, technically it's 5 months and 1 week today being that last Monday was the original celebration, but hey! Better late than never right! I really do wish I could just stop time, but yet I am so excited for what is to come. Anyway, here is a little peak as to how our baby lady is doing! 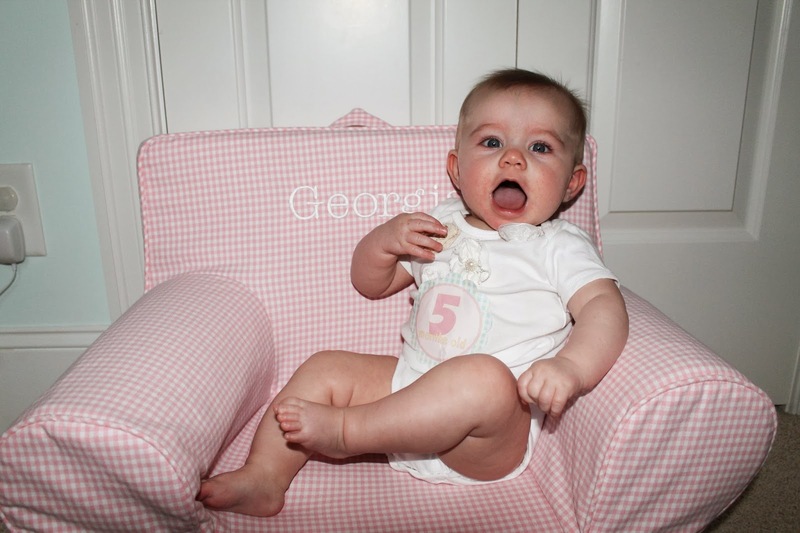 Weight: G is weighing about 15.8 pounds! She is between the high 50 and low 60th percentile in weight now, which is down from her 70-80th percentile but still great! Health: So blessed to say she is a healthy baby STILL. SO thankful for that. Since we kicked her stuffy nose, we haven’t seen anything since then. Hoping to keep it that way! Sleep: OK so this has been a work in progress. I know I’ve talked about it a few times on here already, but G has had somewhat of a hard time finding her sleeping groove since she’s been 2 months old. But! But! She is on the way to finding it. Yes friends, it’s true. Now we still wake up once a night, and sometimes two – but for the most part she is only a once a night waker (usually between 4am-6am) and will go back to sleep until 7 or 8am. Hey, I can’t complain. Social: That kid loves people. Loves them. And December was really her month. With all of the parties and birthdays and holidays! She was in heaven. My high school BFFs and I had our annual Christmas exchange the other week and G ate it up. “Why hello there aunties! You are coming to see me? Spoil me? Love on me?! Go righhhhhhht ahead!” I swear that was what she was saying through that cooky chuckle of hers. And then having all of the family in town on top of that?!? More spoiling. More hugs. And more people acting a fool around her just to see that gummy smile. She obliged everyone and loved every minute. Diet: Still exclusively pumping here and still on solely breast milk! YAY! It’s was a little hard over the holidays and I feel like I was the traveling bag lady with all the things I brought to our parents’ houses (diaper bag toy bad, PUMPING bag!). But we made it and are still pushing onward. I am really trying to soak up this last month before she’s introduced to solids! EEEK. I’m so excited to break out my baby food maker thingy. I’ve been doing lots of research on first foods, etc. and I am considering skipping rice/oatmeal all together at first. Any thoughts? Any mamas have any suggestions? If you did start with a grain, which did you do and how did you introduce it? ANY suggestions would be greatly appreciated because I’ve gots NO clue what I’m doing over here. Pretty standard these days…. Also, I want to thank all of you who reached out to me after the 4 month post regarding my breastfeeding journey. I am happy and eager to share with anyone who needs encouragement, and appreciate all of the encouragement I received from yall! Baby Gear Love: Medela I still love you and your breastpump. We have a special relationship that’s for sure. We’ve also been introduced to Sophie in the past month and she’s a crowd pleaser over here. My Ergo carrier is my best friend as well. Since G has packed on the lbs lately I haven’t used my Solly as much. So when we are out grocery shopping or just out in general, I usually pop her in the Ergo and she is happy as a clam. I also like that she can look out if she wants or if she gets tired and/or overstimulated she can turn her face in and I can cover her little head for a quick snooze. Crying: She usually only cries when she’s hungry now which is a blessing. When she gets overtired she starts rubbing her eyes but no real tears. Thankful for the happy little baby lady that is my daughter. Likes: She LOVES when her daddy gets home from work. It’s like the. Best. Thing. Ever. She also think the tiny baby that lives inside the mirrors in our house is pretty hilarious. Her aunties make her laugh too. She’s pretty tickled over anyone who will give her attention. She loves reading her books too. She tries to hold them now lately and when I turn the page it’s like excitement overload. She kicks and laugh and smiles. I mean the possibilities are endless! Only when she calms down can we actually read the page. And she’s a babbler. She loves talking to her friends – you know her bunny friend, her mermaid friend and of course her sissy. Dislikes: She really doesn’t like it when she has to wait more than .5 seconds to eat. When she’s hungry, she’s hungry. Other than that, she’s pretty good with life! Postpartum: Feeling good still but definitely feeling like I need to start on the exercise train. Especially with summer in the far distance. I’m gonna do it. I am. I think I can I think I can. Milestones: She’s a rolling baby now! Yayy! Well kinda yay. I can’t leave her on the changing table or bed anymore, but it makes her so happy when she can roll to her favorite toy. Her smiles and laughs have also been coming by the second! She starting babbling more and her animation makes my heart smile. I love her ya know. We started rice at about 5 months I think, in a desperate hope it would help him sleep through the night. And it worked!! Of course he is all messed up again because we traveled cross country. But for about a month, it was pure bliss. We switched from rice to oatmeal because Henry went like 5 days between poops and the ped told us that rice can block them up a bit, but oatmeal doesn't. We use the Earth's Best oatmeal cereal. Now that he's older and has had some baby food, I mixed baby food in with it at night. It's a good source of iron and since I have struggled with anemia, I figured he needed that. We started baby food at 6 months with butternut squash and then sweet potatoes. I read you should start them on the sweeter stuff because breastmilk is sweet, so they are used to it. But out ped told us we could start him on whatever he wanted. Emma had tummy sensitivities to dairy/egg/soy when she was breastfeeding and reacted to rice and barley cereal, and slightly to oatmeal cereal. So we skipped it and went straight to carrots. so happy to find your blog! 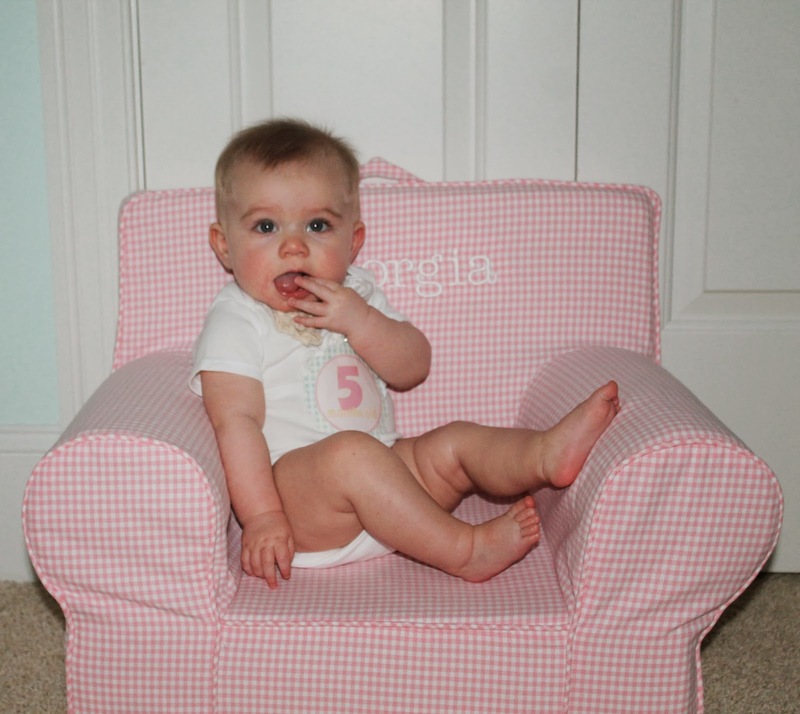 i have a six month baby girl too! !